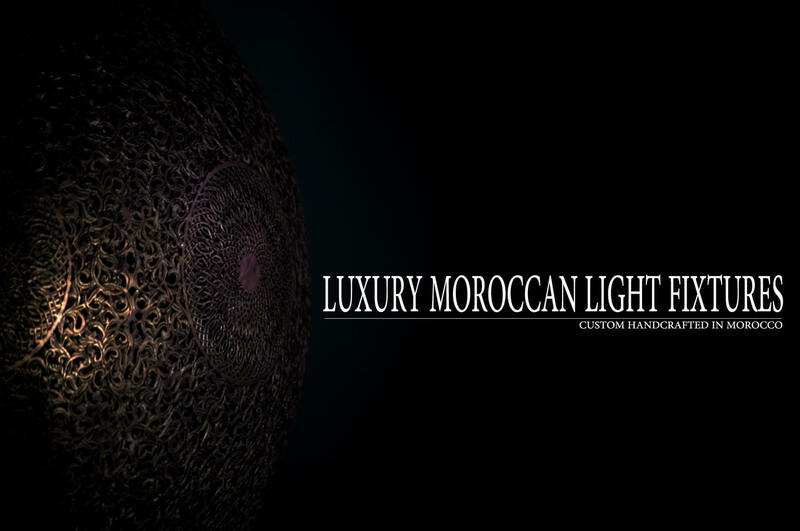 The Leading supplier in the USA of quality Handcrafted Moroccan lamps, Moorish Lighting, Exotic Ethnic Light fixtures. 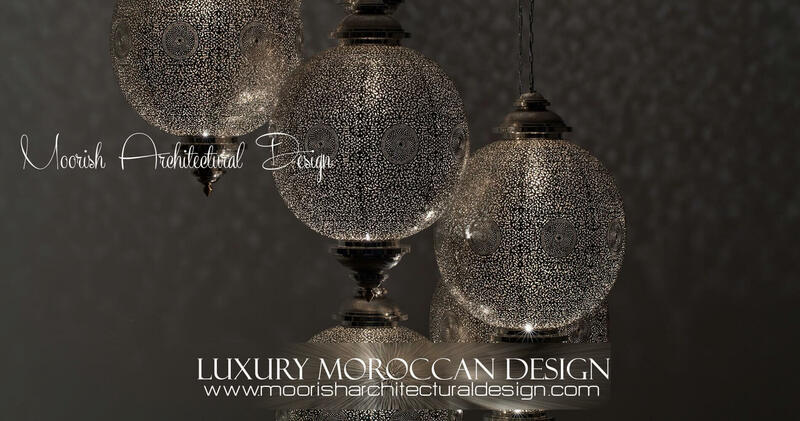 Moorish Architectural Design company is the leading source for custom handcrafted Moorish Light Fixtures including Moroccan lamps, Mediterranean outdoor garden lights, Middle eastern chandeliers, exotic kitchen pendant lights, modern bathroom wall sconces, Spanish hanging lanterns, outdoor ceiling lights. Shop and explore our exclusive selection of authentic Moroccan lighting, handcrafted for your home with our exceptional quality that's made to last. Lighting is one of the key elements in any well-designed space. How we light a space relates directly to how we see it, so time spent deciding on how to put light in a room and where to place it is never time wasted. But lighting is more than a functional requirement of a space. It can also be a strong design element all on its own. The right lighting can be the perfect finishing touch for the style you want in any space, from rustic to mid-century to ultra modern. But for a chic and timeless look, you can't beat the Moorish style lighting. Moroccan lighting is a great addition to just about any room. Not only do they provide excellent light from the best possible place, but as a design element, they can steal the show or just add another layer to a beautifully designed space. Our goal is to educate the public about the Islamic architecture, save, protect, and promote the Moorish art, Moroccan interior design, and to become the world leader in Moresque craft, Arabesque design, Islamic art. Our Light fixtures are handmade from quality materials and sourced with the environment in mind. We believe that handcraft is the very heart of good design and will prevail as one of our most sustainable assets. Our team of professionals offer a rare level of skills, many years of experience and we are passionate and dedicated to our brand. We truly l.o.v.e what we do, we “live” the creation of extraordinary, authentic Moorish style lighting fixtures pieces and let our imagination guide us to constantly evolve, experiment, reinvent and take risks to reach higher levels. Our mission is simple – to create exclusively designed luxurious light fixtures utilizing quality materials. Moorish Architectural Design's collections have generated a significant following of a high-profile clientele, including Prince of Abu Dhabi (Prince Mohammed bin Zayed Al Nahyan), Saudi Arabian Cultural Commission (Fairfax,Virginia), high-end hotel chains & resorts such as Four seasons hotels ( Dubai, UAE also Casablanca, Morocco), Continental hotel " New Orleans, Louisiana, The Walt Disney company ( Hong Kong Disneyland, Shanghai Disney Resort), and much more. Choose from our diverse collection of hundreds of Moroccan lights, or let us custom design the light fixture piece of your dreams. Our products rivals any high end decor on the market for its unmatched craftsmanship and quality.No matter your taste, we strive to bring you original Moorish style light fixtures that last.Whether you are building, designing or decorating your residential home or hospitality projects such as hotel, Mediterranean restaurant, luxury resorts, Moroccan hammam Spa, Moroccan majlis, private yacht, commercial building or restoring a Spanish colonial revival historic building, we will help you achieve your Moorish decorating and Moroccan style architectural design dreams.